Kim Kardashian and Kanye West are seen on December 03, 2018 in New York City. Kim Kardashian is trying to cut a budding controversy out at the root. On Sunday, Kanye West hosted a service, during which he addressed how controversial musicians have been treated by the public. "Everybody they want the art from the artist, but anytime they do anything erratic, they just gonna pull up full documentaries on them and then they gone come with the Michael documentary...We can enjoy all they music all we want," he said at one point, insisting if that's the case, we also take down Leonardo da Vinci's art. "Let's take down all the art." The comments seemed to be in reference to the upcoming "Leaving Neverland" documentary, which explores the sexual abuse allegations against the late king of pop. Michael Jackson's estate denounced the project. The rapper seemed to be speaking also of R. Kelly, who is under mounting public scrutiny after Lifetime's "Surviving R. Kelly" docuseries aired, publicizing various misconduct allegations against the singer from multiple women. Kelly has consistently denied any allegations of misconduct. After the service, Kardashian took to Twitter to clear up any bubbling headlines misinterpreting his comments. "I'm going to nip this in the bud right now. 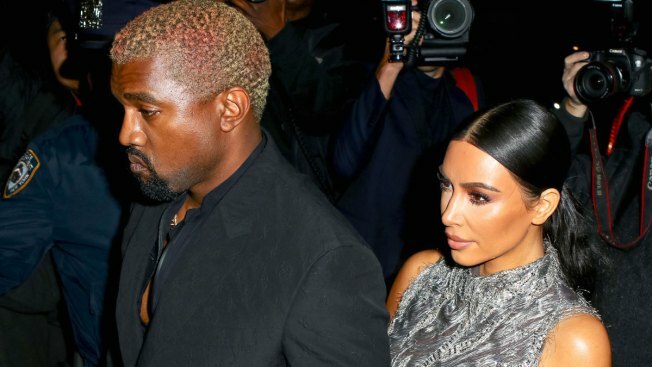 Kanye was speaking about his own experience of everyone quick to say they are cancelling him because of differences in opinion ¬ being perfect," Kardashian wrote. "The analogies were in context to his own experiences, not defending anyone else." The mother of three continued, "I want to make it very clear, he is not condoning anyone's actions or unacceptable disgusting behavior. My husband's words are being taken out of context due to timing." During the service, West touched on the backlash he's faced in recent months. "Some of us are just programmed to be more scared than others, but I represent that overcoming fear and still being here...they say you can't do that...you can't do that--you'll lose your career, but I'm still here."